Under normal circumstances, dental cavities are treated by drilling away the decay and restoring the empty space with a composite resin or amalgam filling. Because this traditional approach isn’t always an option for very young children and certain special needs patients though, board-certified pediatric dentist, Rosalie Nguyen, DMD, and the team at Edgewater Pediatric Dentistry in Edgewater, New Jersey, offer silver diamine fluoride (SDF) treatments to stop dental decay quickly, easily, and painlessly. To learn more, call the office or schedule an appointment online today. SDF is a topical antibiotic medicine used to arrest active spots of dental decay and keep them from spreading. Commonly referred to as 38% SDF, this colorless liquid contains silver particles, fluoride, and other ingredients that help stop cavity progression as soon as it’s applied to your child’s tooth enamel. This fast, easy, and painless cavity treatment can help young patients keep their mouth healthy while delaying or even avoiding traditional dental fillings. Is SDF a good option for my child? If your child is too young to undergo traditional cavity repair in a cooperative manner, or if you have an older child with intellectual or developmental disabilities, silver diamine fluoride can be an ideal solution. SDF is a form of immediate cavity intervention, in that Dr. Nguyen and her team can apply the special liquid as soon as they discover an area of decay. Although SDF is powerful and long lasting, it must be reapplied every 6-12 months to keep dental decay permanently immobilized. Silver diamine fluoride isn’t a good option for children with symptomatic cavities that cause pain or tooth sensitivity. It’s also not an option for children who are allergic to silver or have painful sores or raw areas on their gums or other soft tissues. Will my child eventually require a filling? SDF is generally used on primary teeth, commonly known as baby teeth, to keep them as healthy as possible until they’re ready to fall out. As such, the treatment makes it possible for many children to avoid fillings altogether. Children who have a higher degree of decay may eventually require a traditional filling or a crown, even in their primary teeth, if their cavity is highly visible or interferes with their bite function. This is due to the fact that while SDF does an excellent job of stopping the progression of dental decay, it doesn’t repair the affected area. The only way to restore optimal aesthetics or function is through fillings and other traditional cavity repair measures. Are there any alternatives to SDF? If your child’s cavity is still in its earliest stages, a fluoride treatment may help reverse the decay and restore their tooth enamel. Like SDF, fluoride is a quick, easy, and painless treatment that’s applied directly to your child’s enamel. It’s important to note, however, that SDF has been shown to be more effective at stopping the progression of cavities than fluoride treatments. In particular, SDF appears to be better at preventing the spread of decay to adjoining teeth. 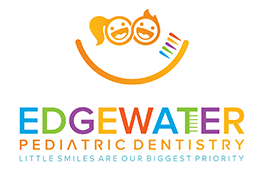 To learn more about silver diamine fluoride, call Edgewater Pediatric Dentistry or schedule an appointment online today.